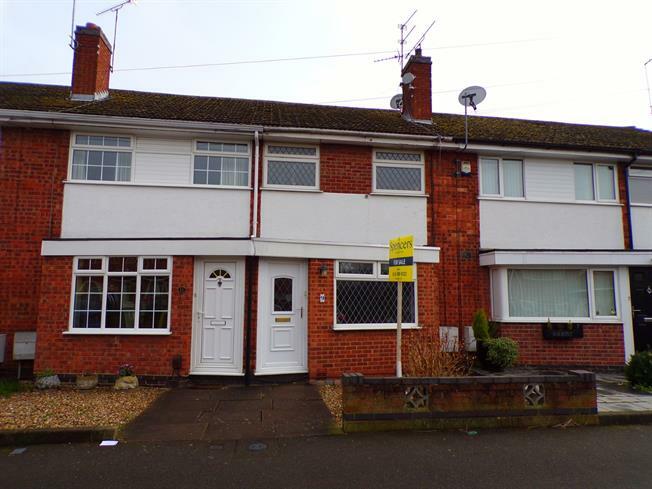 3 Bedroom Terraced House For Sale in Wigston for Offers Over £160,000. This property is tucked away and in close proximity to the centre of Wigston. This mid terrace property has an entrance porch, living room, kitchen with open arch to a conservatory area, ground floor bathroom, to the first floor there are three bedrooms, to the front of the property is a small garden, further garden to the rear and a garage within a block. Double glazed uPVC window with leaded glass facing the front. Radiator. Laminate flooring. Roll top work surface, wall and base units, single sink with drainer. UPVC French double glazed door, opening onto the garden. Double glazed uPVC window facing the rear overlooking the garden. Radiator, laminate flooring. Double glazed uPVC window with obscure glass facing the rear. Radiator. Low level WC, panelled bath, wash hand basin. Double glazed uPVC window facing the rear overlooking the garden. Radiator, fitted wardrobes.